Bank and Credit Union branch offices have historically been the front line of the customer relationship. But at a time when more than 50 percent of Americans utilize online or mobile banking, Bank and Credit Union branches are challenged to stay relevant. As people continue to migrate from the branch to online channels, the frequency of branch visits will continue to decrease. Couple that decline with enormous operation expenses, financial institutions will struggle to stay profitable using their current model and must reimagine new ways for the branch to cater to the needs and wants of today’s modern consumer. PWCampbell, a leader in branch reimagination within the financial industry, is helping Banks and Credit Unions transform their branch environment from what was once a transactional hub with the traditional teller line as the main focal point to a dynamic experience that focuses on sales, service, consultancy and the use of technology. 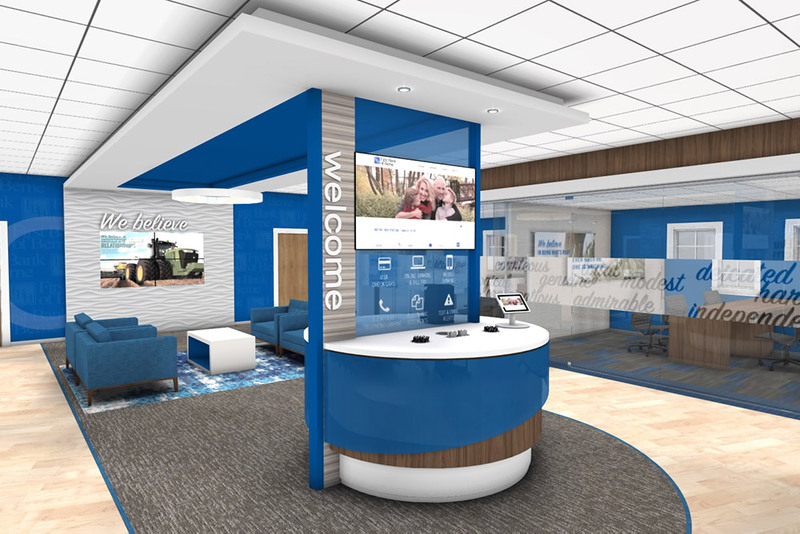 Whether you are looking to build new or want to renovate existing space, PWCampbell excels at employing the “Branch Reimagined.” From teller pods to tellerless machines, PWCampbell will work with you to develop a branded visitor experience that is just right for your organization. This new approach to staffing, which goes hand in hand for branch reimagining, is becoming very prevalent as it allows for fewer tellers, greater convenience, increased productivity, improved visitor satisfaction and a boosted brand experience. The fundamental principal of this model is the combining of teller and platform positions into one universal role – a role which requires fewer but highly educated, well-rounded individuals. Since this significant modification does allow for fewer branch staff and alters the way that staff interacts with customers, the layout and design of the branch must also be altered to support the new experience. Banks and Credit Unions must emphasize the visitor encounter by modernizing with dialogue pods where more personalized communication and cross-selling can occur instead of the old-style teller lines that are primarily transaction oriented. In addition, Banks and Credit Unions must provide more interactive capabilities by utilizing current technology. Advancements such as iPads, touch screens, digital marketing and Interactive Teller Machines (ITMs), allow for greater convenience and flexibility while decreasing the amount of space needed within the branch environment. PWCambell has helped many institutions implement the Universal Banker Model. From developing staffing plans, to redesigning the branch layout to reducing expenses and enhancing the visitor experience to modernizing with current technology, PWCampbell is your one stop solution.